» Trampoline Physics: How Do Trampolines Work? 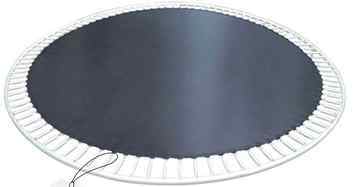 Trampoline Physics: How Do Trampolines Work? Jumping on a trampoline can be incredibly relaxing, as well as a lot of fun, but do we know how trampolines work? Are we aware of how trampoline physics work? Well, we are, and hopefully, we can help you out too. The science behind these amazing objects includes some chemistry, some biology, and a lot of physics. Don’t worry, we’ll explain. Yes, trampolines are definitely a fun activity for the entire family, but trampolining is also among the best possible exercises. So, if you were delaying going to the gym, a trampoline can solve your problem. Bounce each day, and you will be in top form. You see, every time we jump on a trampoline, we experience a weightless state for a couple of short moments. That means that once we hit the very bottom of the mat, our bodies get to experience up to 4Gs of gr﻿﻿avitational force. Interwoven in a complex array, basic laws of physics are what make trampolines as fun as they are. 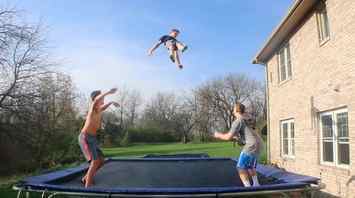 No other exercise can provide the health benefits that jumping on a trampoline does. Lymphatic system benefits – jumping on a trampoline for a few minutes each day can drastically increase lymph flow in our bodies. That means that jumping on trampolines will make it a lot easier for our bodies to throw out the waste. Cancer risk reduction – Improving our lymphatic system leads to our bodies being able to destroy cancerous cells in our bodies with more ease. Bone mass strengthening – trampolining helped astronauts, who came back from space, to regain bone mass. That means that this simple hobby can prevent osteoporosis and reverse some bone damage. As we can see, jumping around on a trampoline is not a simple matter at all, at least not from the physics standpoint. But, the rabbit hole goes deeper when you start looking into different types of energy you use to bounce off of a trampoline. 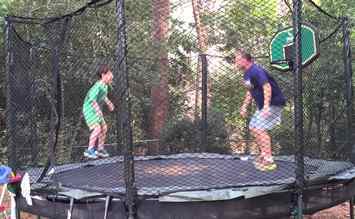 Believe it or not, bouncing on a trampoline is a classic energy conservation example, and it shows how energy goes from potential into kinetic. And, not only that but, trampolines actually work through reverse transformation. Namely, as we jump onto a trampoline, the gravity helps us gain kinetic energy. And, once we hit the trampoline, we start stretching the mat downwards, transforming our kinetic energy into the potential energy and transferring it to the springs. Once we “run out” of kinetic energy, the reverse transformation will happen, and our upward motion will begin. So, let’s take a closer look at both kinetic and potential energies at play. As we said, both of these are important for how trampolines work. 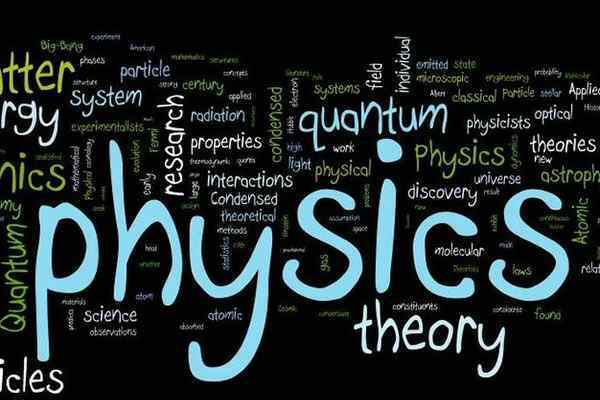 Kinetic energy – this energy is created when an object with a certain mass is moving with a certain velocity. Basically, as you jump on a trampoline, and as your velocity goes up and down, so does your kinetic energy. Your kinetic energy is the greatest the moment before you hit the trampoline on your way down and leave it on your way up. It is literally zero when you reach the maximum height of your jump and when you’re on the trampoline, ready to jump again. Potential energy – this energy changes together with kinetic energy. Your total energy is the sum of your kinetic and your potential energy. As you jump up from a trampoline, your kinetic energy becomes smaller the higher you go. Or, to put it simply, you slow down. As this happens, your kinetic energy become potential energy. As you fall, you gain speed, and your potential energy turns back into kinetic energy. Both of these principles are important to understand how trampolines work, as they are a classic proof that total energy remains constant over time. Elastic potential energy, to put it very simply, is the energy that is stored within an elastic object. It comes from the deformation of an object whose elasticity demands it to return to its original state. Most common examples come from stretching elastic clothes and springs. Hooke’s law explains this perfectly. The force you require to stretch a spring is directly proportional to the amount of stretch that happens. So, if you want to calculate the amount of potential energy you generate and give to the springs, you just need to calculate the work you exert. The best way to explain how a trampoline works is to quote Newton’s third basic law of motion that says “for every action, there’s an equal and opposite reaction.” So whenever you’re jumping on a trampoline, two forces are in action – forces of action and reaction. Each time you push down on the trampoline, an equal and opposite reaction will push back. So the only force that is acting upon the jumper on a trampoline is actually the force of gravity. The springs are the most important parts of any trampoline. That is where all the magic happens. They are the bits that store the potential energy so that they can release it and send you bouncing upwards. And, finally, it is the time to talk about the beginning of all of the best trampoline trick jumps - the double bounce. It is something we can achieve by jumping together with another person. Having two people jumping means doubling down on the kinetic energy as we hit the mat. And, logically, it means doubling down on the potential energy we transfer to the springs. But, the trick with the double bounce is to have one of the two people forfeit their energy. So, instead of letting the trampoline bounce them into the air, they pull their legs back in. When they do that, all of the potential energy from the springs goes directly to the other jumper. So, in the end, the other jumper gets double the bounce and some more air time to perform any tricks he wants. Finally, “how does a trampoline work” is not such a complicated question. As you can see, trampoline physics is not a mysterious field of science that only absolute geniuses can understand. Simple and straightforward, trampolines are all about bounce, balance, and fun. So go, bounce away on your own trampoline (or if you don’t have one, order it so you can do the bouncing).